There are only a few people on the street, which is blocked at either end. One man averts his gaze as he walks past. Suad spots him and turns her sign so that it is facing him. He lowers his head and walks faster to avoid reading it. Another passer-by, a young man, has the courage to look at the sign despite the watchful eyes of eight security guards, and gives a thumbs-up sign. “This is the sixth day, no – maybe the seventh.” Suad is lost in counting off the days of her solitary protest outside the headquarters of the strongest armed faction in the city. 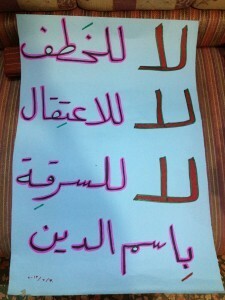 “I started my protest after civil activists known for opposing the regime were kidnapped on July 24. Because ISIS is the prime suspect, I decided to protest outside its headquarters,” Suad told me. he was happy to have her full name given, but after seeing the fear in her sister’s eyes, I decided not to do so. Suad is a primary school teacher who was sacked at the start of the Syrian revolution two years ago because of her overt opposition to the regime and because she took part in demonstrations calling for its downfall. That was a year-and-a-half ago, when Suad held her protest in the middle of Tal Abyad Street, a crowded market in the city centre, challenging the security forces. Suad holds up a placard that says “ISIS prisons= regime prisons.” Photography by Zaina Erhaim. “We started with a placard, and we will go back to it,” she added. The sensation of fear disappeared with the first bullet that the security forces fired at a demonstration she was in over a year ago, she said. Suad has a set of placards that she stores away carefully when she comes back from protesting. One says, “How did you enslave people when their mothers begot them free?”, and on others she has written, “We are the Syrian people – who are you?”, “A candle to light the darkness of your prisons – freedom for our kidnapped people” and, “We want all the kidnapped people”. This last sign enraged one of the guards at ISIS headquarters. Suad points out that the oldest of the ISIS security guards is no more than 17. Raqqa province has seen rising numbers of kidnappings, starting with Abdullah al-Khalil, head of the provincial council; then all the members of the Tal Abyad village council; the activists Firas al-Haj Saleh and Ibrahim al-Ghazi – the latter was behind the “Our Flag” campaign to paint the banner of independence on the city’s walls; and finally Jesuit priest Father Paolo Dall’Oglio, and Abu Tayf, commander of the Omana al-Raqqa brigade. Activists have staged several sit-ins in protest at the spate of abductions, most recently to demand the release of Father Paulo, who disappeared on July 30 after entering ISIS headquarters for a meeting with the group’s leader or “emir”. Despite being warned not to, Father Paulo insisted on meeting the emir to discuss, among other things, the fate of those abducted. Before going to the appointment, he asked supporters to wait three days before declaring him kidnapped, as he planned to stay until he accomplished what he had come for. Among other city residents, including even anti-regime activists, the fear is tangible. Some have opted to remain silent and postpone conflict until the Syrian regime collapses, while others believes it is up to the gunmen to fight it out between themselves. As she holds her one-woman protest, Suad gets to hear the pleas of the dozens of people who come to ISIS to ask for their kidnapped sons and daughters. “I’m standing a meter away from them [ISIS members] and I just wish someone would come to them to ask for a solution to a [normal] issue or a to complain about a theft,” she said. In turn, the wife of kidnapped activist Firas al-Haj Saleh is concerned about Suad. “I am sure they will harm her if she carries on protesting, just as they did to Firas, his brother Mohammad and others,” she said. Suad never stays silent. She plans to carry on as long as the kidnappings continue. She believes being female is a strength. “If I was a man, I surely wouldn’t be able to protest. They would have detained me within the first minute,” she says. *Zaina Erhaim is a journalist in Syria, working as a consultant for the Institute for War and Peace Reporting, which manages the Damascus Bureau. This story first appeared in Arabic on her blog.